Newark Cemetery is located on London Road, NG24 1SQ. 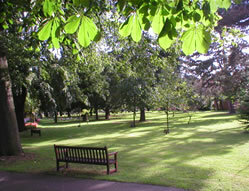 The Cemetery lies close to the Town Centre on London Road and was not just conceived and built as a memorial and resting place but also as a park for the people of the Town. The Cemetery is also important internationally as it contains the Polish War Cemetery and was the historical burial place of General Sikorski (the wartime leader of Poland) whose body has now been returned to Poland, but whose memorial remains. There is more information about this section of the Cemetery on our History Pages. Within the Cemetery there is also a Chapel Interpretation Centre. This is the former Chapel which was converted in 2009 with money from the Heritage Lottery Fund. The Centre has information and display boards explaining some of the history behind burials, the families that use the site, the flora and fauna that can be found there and famous Townsfolk buried there. The Centre is also used as a room for training courses, sympathetic with the Cemetery environment. It is available for hire at a modest, no profit, fee. It can be used for small exhibitions, as a meeting place for small groups, or as a school room, an artistic studio or a quiet area. It can also be used for small religious meeting.